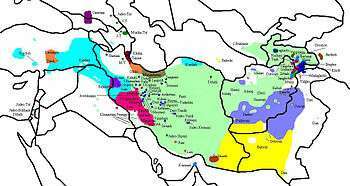 The Iranian languages or Iranic languages are a branch of the Indo-Iranian languages, which in turn are a branch of the Indo-European language family. The speakers of Iranian languages are known as Iranian peoples. 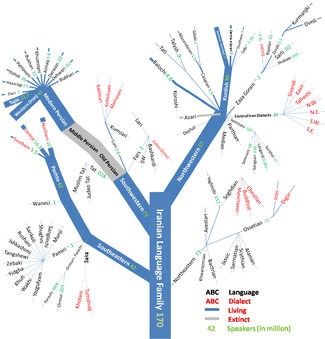 Historical Iranian languages are grouped in three stages: Old Iranian (until 400 BCE), Middle Iranian (400 BCE – 900 CE), and New Iranian (since 900 CE). Of the Old Iranian languages, the better understood and recorded ones are Old Persian (a language of Achaemenid Iran) and Avestan (the language of the Avesta). 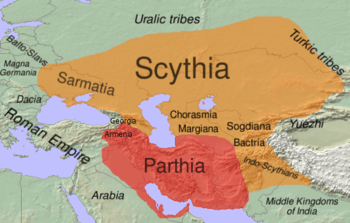 Middle Iranian languages included Middle Persian (a language of Sassanid Iran), Parthian, and Bactrian. As of 2008, there were an estimated 150–200 million native speakers of Iranian languages. 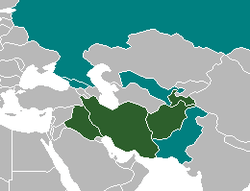 Ethnologue estimates there are 86 Iranian languages, the largest amongst them being Persian, Pashto, Kurdish, and Balochi. The term Iranian is applied to any language which descends from the ancestral Proto-Iranian language. Iranian derives from the Persian and Sanskrit origin word Arya. The use of the term for the Iranian language family was introduced in 1836 by Christian Lassen. Robert Needham Cust used the term Irano-Aryan in 1878, and Orientalists such as George Abraham Grierson and Max Müller contrasted Irano-Aryan (Iranian) and Indo-Aryan (Indic). Some recent scholarship, primarily in German, has revived this convention. Northwestern, of which Kurdish is the largest member. ↑ Hammarström, Harald; Forkel, Robert; Haspelmath, Martin; Bank, Sebastian, eds. (2016). "Iranian". Glottolog 2.7. Jena: Max Planck Institute for the Science of Human History. ↑ Gordon, Raymond G., Jr. (ed.) (2005). "Report for Iranian languages". Ethnologue: Languages of the World (Fifteenth ed.). Dallas: SIL International. Schmitt, Rüdiger (ed.) (1989). Compendium Linguarum Iranicarum (in German). Wiesbaden: Reichert. ISBN 3-88226-413-6. Yarshater, Ehsan (ed.) (1996). "Iran". Encyclopedia Iranica. 7. Costa Mesa: Mazda.